Lately I can't get enough of his chubby cheeks (who knew he was 2.5 weeks early?! ), his smiles and even his drool (poor little guy is teething like crazy!). I'm trying to relish in him as much as possible, amidst the chaos; sometimes this translates into me going nuts with the baby talk, but I just can't help myself. Knowing how silly I sound to other adults still doesn't stop me! This is the last time I have a little baby all to myself so I'm doing my best to savor each day. He's adorable! My baby is 15 months old and I still can't get enough of his soft, squishy cheeks. I keep begging him to stop growing up, but he just won't listen. He's beautiful, your boy! And I just love his name. I am on board with your thoughts. Home with my third (and last?) son and soaking in the delicious baby smell and cuddles and baby talk. Before I know it, he will be off to school. 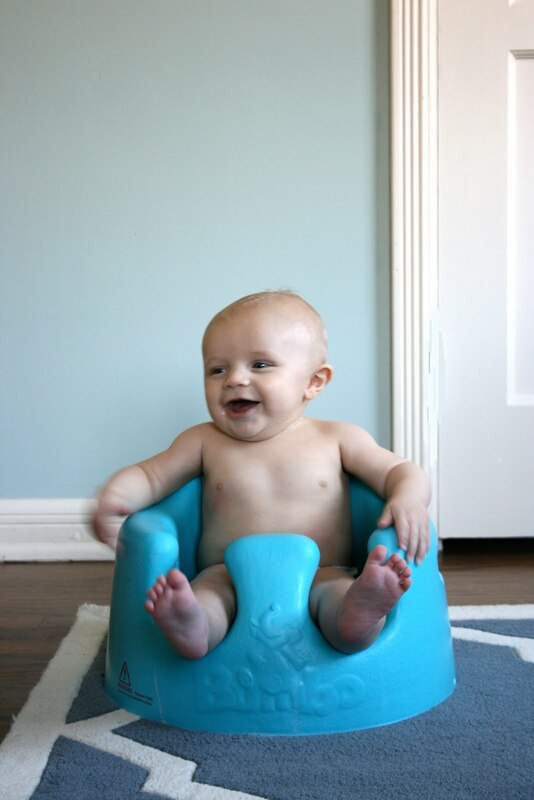 Also, I have a question about the Bumbo : Until what age do they use it? I just realized they are available on Amazon.fr! My son is near 7 months but doesn't sit up on his own yet. Is it worth the investment for one or two months? He is so so lovely! Time really does fly and he looks so healthy and happy. It's so hard to stop and enjoy the little moments with them before they are gone. He's gorgeous, Steph! Thanks for posting the pic, it brightened my morning. He is gorgeous! I hope you are enjoying Seattle. There are days I greatly miss the NW! Oh, good. I love seeing him (photo version) 5 months later. So sweet! (He looks most like your third?) I really miss the baby stage. p.s. Baby Gray is such a great name to say and read. I love it. p.s. I posted this pic b/c Rebecca Mudrick asked me to :) We should all try to get together sometime! also- this is the exact rug i'm saving up for (i think, if it's from overstock) - so i'd love a rug post as well! Enjoy every minute! It's crazy how quickly time goes by! My little one is a month old now and I feel like I just brought him home yesterday! Thanks for posting a recent picture - he is so adorable! Give him an extra squeeze for me. Love your blog! I'm curious what the rug brand is? I LOVE the picture too! BTW, our baby Gray just graduated out of his Moses basket we bought from you. He loved it! oh man that is some serious sweetness!! !